Alton Foxgleam stands tall for a halfling at 3' 2" and weighs 36lbs. He dresses very richly, preferring a dark crimson doublet with golden trim over a white shirt. Alton chose the color because it "brings out the emerald of his eyes." His trousers are similarly embroidered, but otherwise plain. Alton wears a pierced gold coin on a chain across his neck and he usually possesses a sly, knowing grin. Alton is a professional gambler by trade, a man of mind that one must make their own luck. As a result, Alton carries all manners of gaming equipment, from decks of cards and dice to coins and knuckle-bones, all kept in very fine patches that are draped across his chest on a belt-like chest holster. He is very lightly armed, carrying only a dagger and a sling; as a youth Alton had dreams of being a professional slinger and only gave up the trade when he was cursed. He still carries around the old thing for sentimental purposes, however. When Alton was a youth, he had an encounter with an otherworldly presence that unbeknownst to him weakened his temporal connection. This temporal disturbance is what accounts for much of his "luck" as well as his spellcasting. For example, when he summons a monster, he is actually opening a brief temporal rift, causing a monster to tumble through it into the present. This weakened connection has its negative side effects on Alton, however. Although his body is assimilated to the spiraling eons around him, foreign objects are less lucky. Any object Alton directly holds in his hands suffers rapid aging until it is tattered, worn, and broken; only to return to normal the moment Alton's fingers cease touching it. This curse is the reason Alton had to abandon his dreams of becoming a professional slinger, and his weapon decays the moment he attempts to use it. Alton's voice is also often overcome by countless words, both that have been said and haven't yet been uttered. While he is normally able to control this, when Alton is extremely stressed or unfocused he begins to babble gibberish in countless tongues. His "luck" and guile have made Alton into a very successful gambler. 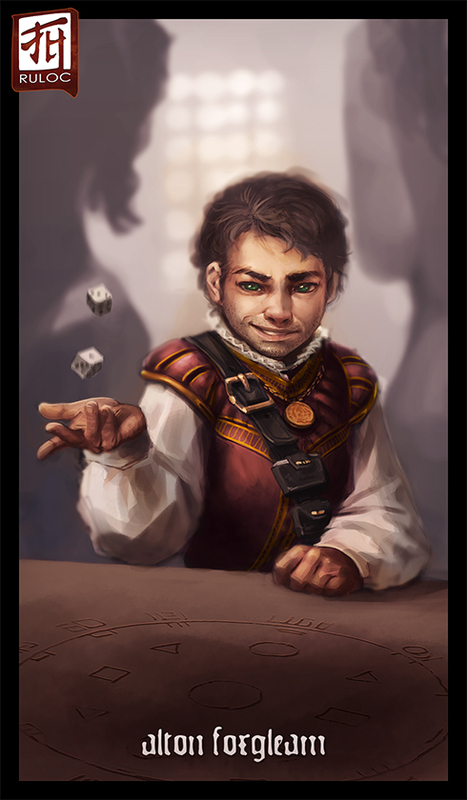 Preferring to live among humans because he finds them easier to bluff and feint in games, Alton loathes being referred to as a child and goes to extremes to point out his age; he seldom wears boots or shoes and possesses a tattoo of a golden coin and a pair of dice on his upper left arm. Although he does not allow himself to grow a full beard, Alton does leave a ragged stubble on his his chin. Amusingly to most of his human companions, Alton is something of a womanizer and can often be seen with a lady around his arm or hitting on bar wenches; sometimes both at the same time.